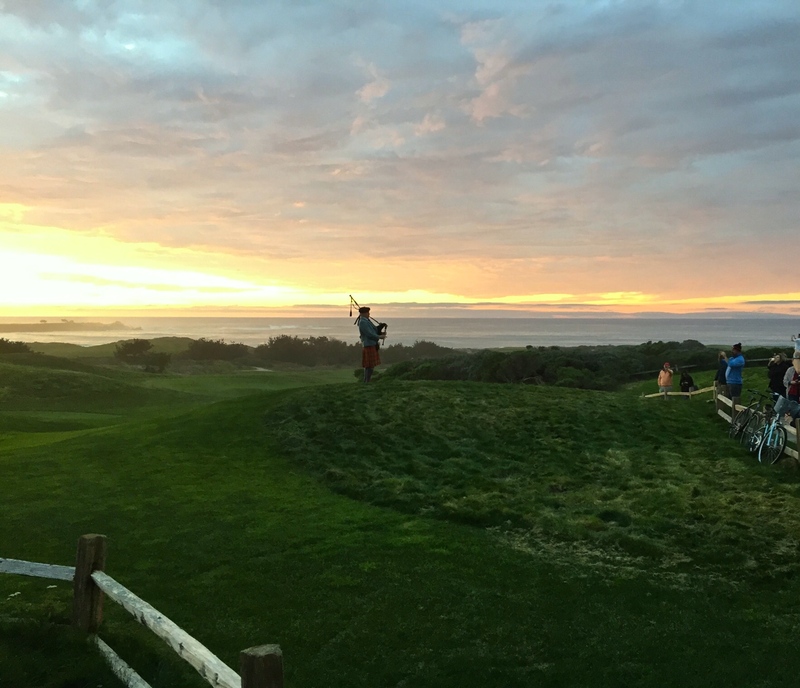 That’s Monterey Peninsula. The gorgeous seems to ooze from every rock and tree and wave. It’s hard to imagine a more beautiful juxtaposition of land and sea than you’ll find on this part of California’s central coast, about 120 miles south of San Francisco. Tall pines and twisted cypress trees, the massive granite rock outcroppings softened by dunes carpeted in native coastal sage scrub and iceplant. I can snap a photo here, slap it straight onto Facebook or Twitter with no editing-not even cropping the thing–and it looks like I hired Monet to turn it into an oil painting. You can feel it even before the coastline comes into view. You want to be here. It doesn’t matter in what capacity. Selling t-shirts. Washing cars. Maybe just doing odd jobs and living out of a van. These ideas start to make sense. And the crazy thing is, you know you’re not the first person to feel this way. Maybe they need some help at the garlic shop in Monterey, or I could just sell artichokes by the side of the road in nearby Castroville. (Because of course this paradise of a place is also a Garden of Eden when it comes to growing produce, part of the Salinas Valley, often referred to as “Salad Bowl of the World.”) If I had just taken bagpipe lessons instead of piano all those years, maybe I could make the rounds each day at sunset, like the guy and the gal who took turns at The Inn at Spanish Bay, one of the Pebble Beach golf and resort properties that lie between Monterey and Carmel-By-The-Sea, along the scenic 17-Mile Drive. 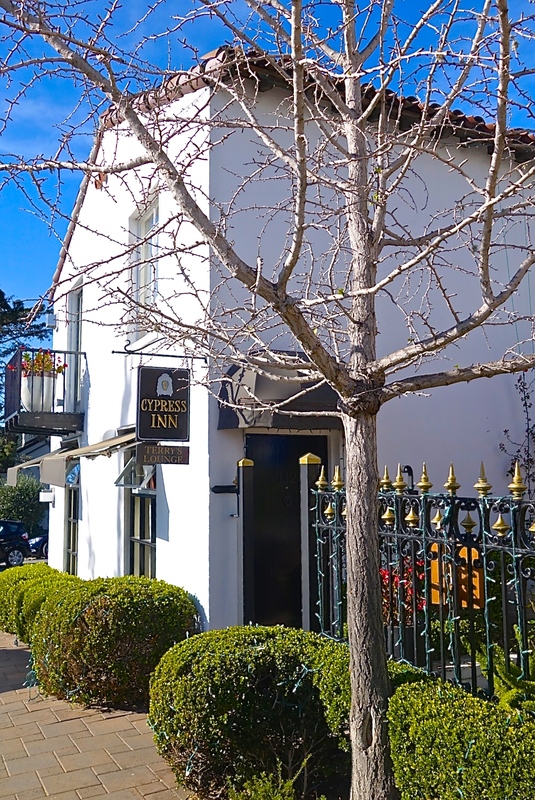 If I lived here, I could be a regular at The Restaurant at Mission Ranch in Carmel, sitting at the cool little piano bar just inside the door. Mission Ranch is a former dairy farm that has been carefully restored and repurposed into a hotel, restaurant and event complex by owner Clint Eastwood. Housed in the former creamery building, the restaurant somehow manages to be swank yet totally warm and laid-back. Imagine the bar from Eastwood’s 1986 war flick, Heartbreak Ridge, regulars and newcomers mingling together, telling wry jokes, sharing old stories–it’s like that here, only without the Marine memorabilia on the walls. The dishes range from upscale country club fare (There’s a prime rib sandwich on the dinner menu.) 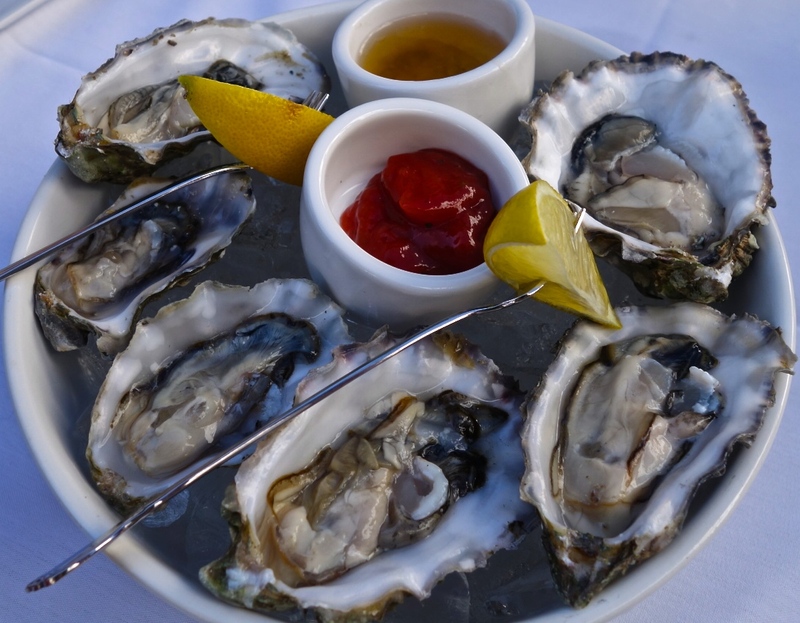 to fine seafood and steakhouse favorites. This isn’t food that’s trying to sit on the cutting edge. It’s the familiar done well. Our waiter, Juan Carlos, sported a thick, black pompadour and a broad, easy-going smile. 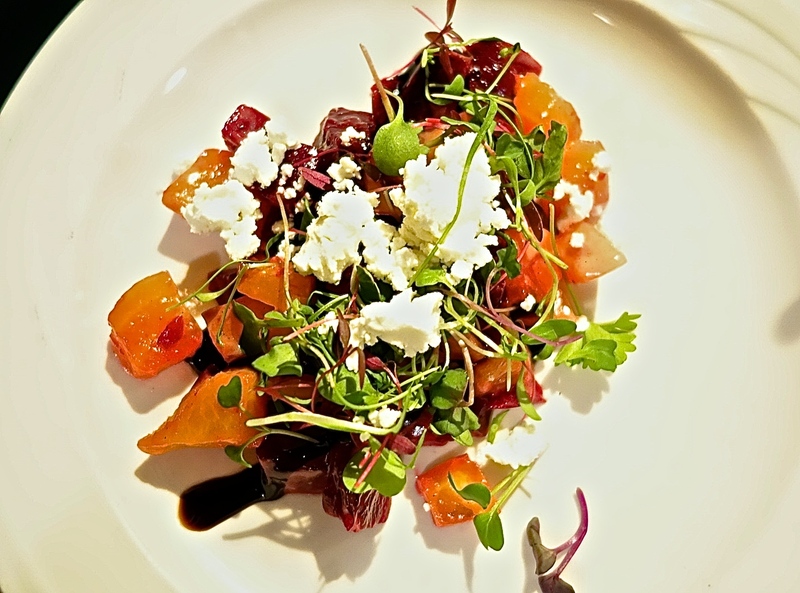 For the salad course, he brought us a melt-in-your-mouth jumble of golden and red beets, with micro-greens and creamy goat cheese. I wanted to sample one of the area wines and settled on the 2011 Joyce Carmel Valley Pinot Noir. But Juan Carlos informed me that they had sold the last bottle. So I went in another direction and opted for a 2010 John Anthony Syrah from the Oak Knoll District of Napa Valley. Intense dark fruit, hints of chocolate and tobacco, and tannins that were prominent yet refined. 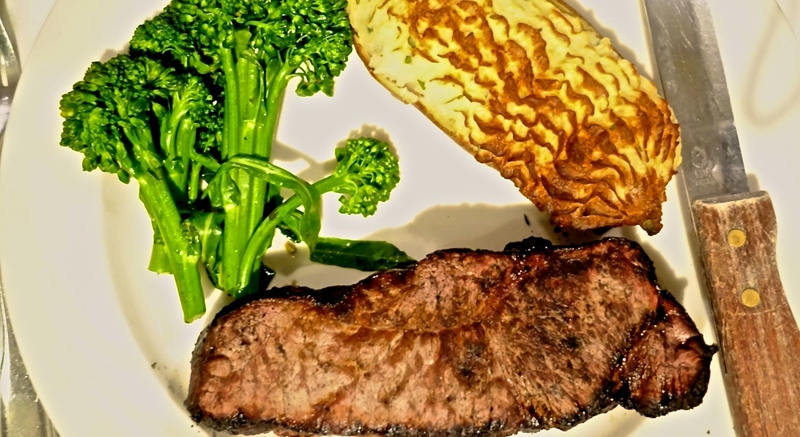 It was a delicious partner to the rare strip I ordered, which came to the table perfectly charred, along with a twice-baked potato and broccoli spears. For dessert, John and I split the “Individual Pecan Pie.” It was the highpoint of the meal, one the most satisfying pecan pies I have ever put my mouth on. 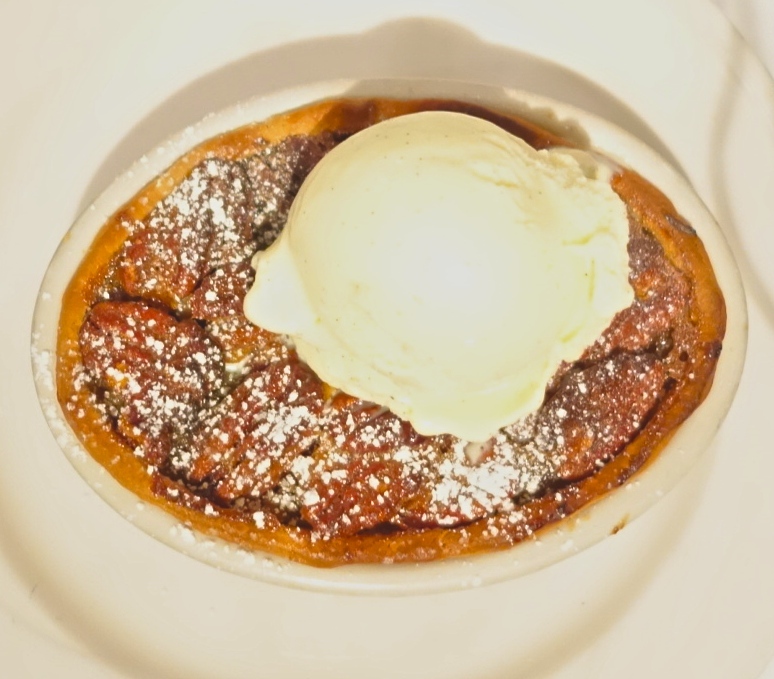 Instead of the mushy, gritty nuts and stickiness that are the hallmark of many pecan pies, this large tartlet displayed just the right carmel butteriness and a deep toasted crisp of whole pecans, crowned with a creamy well-chilled scoop of homemade vanilla bean ice cream. So good that I had to think twice about sharing it. 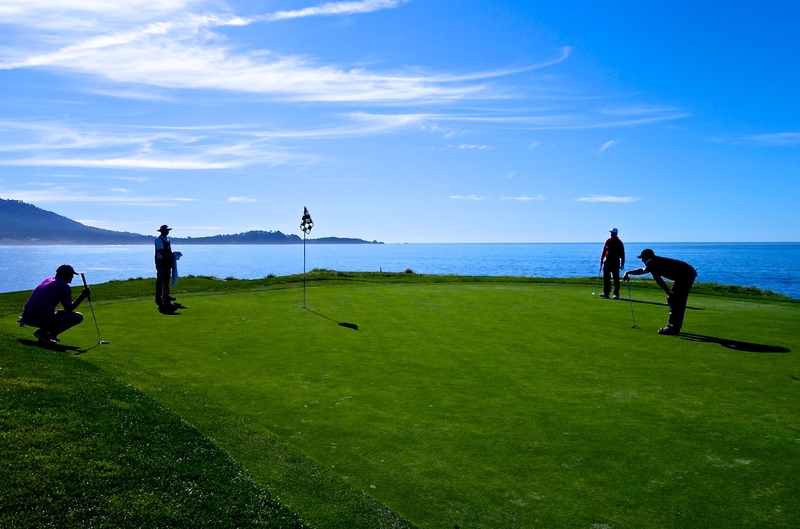 It turns out that January is a good time to visit the Monterey Peninsula. Off-peak season is December through March, and instead of packs of tourists, it seemed that we were sharing the streets with locals. On a couple of days we explored the many shops and art galleries in Carmel. 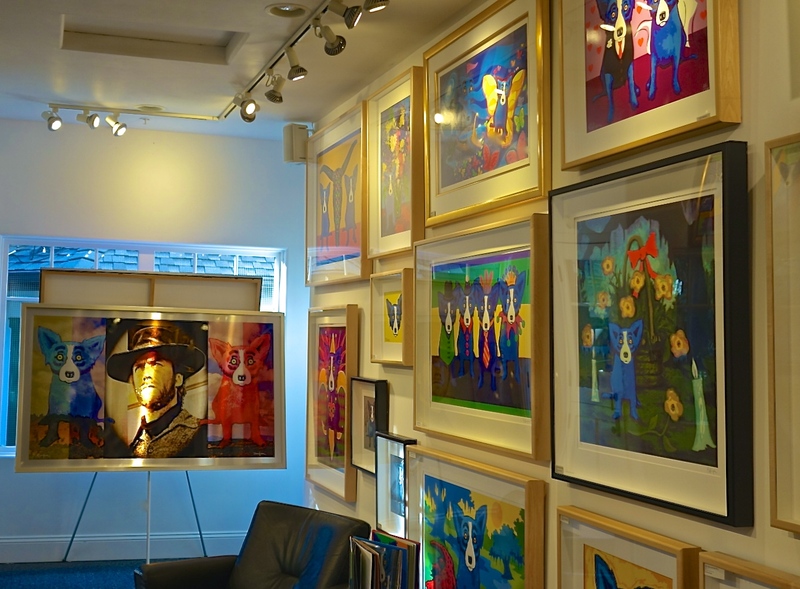 I stepped into the Rodrigue Studio Carmel to admire the work of the late Louisiana artist George Rodrigue, whose Blue Dog art and Saga of the Cajuns series are some of my favorites. 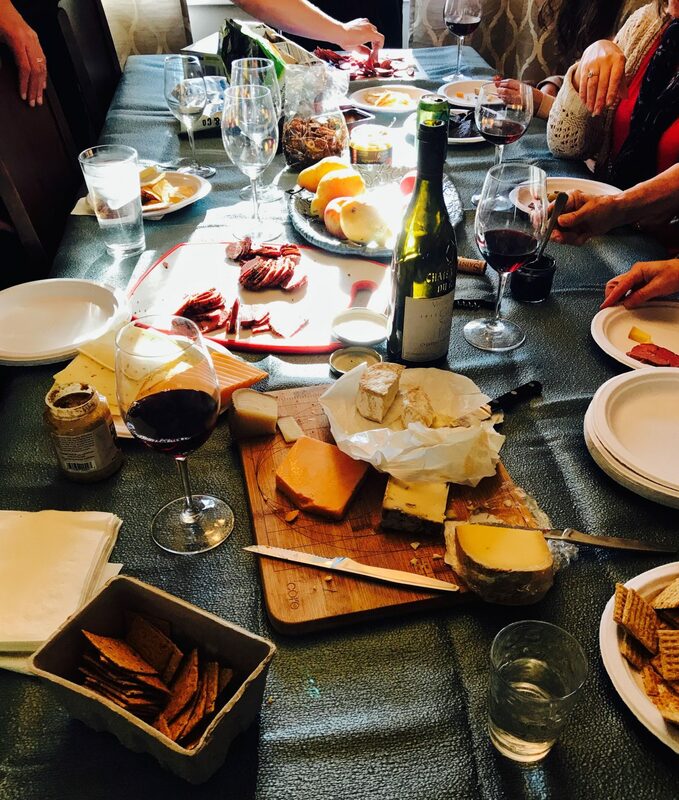 Good restaurants and wine tasting rooms are everywhere you look in Carmel, along with an abundance of stylish boutiques. We did more window shopping than actual buying, though, since even a cute t-shirt in some places came with a 3-digit price tag. 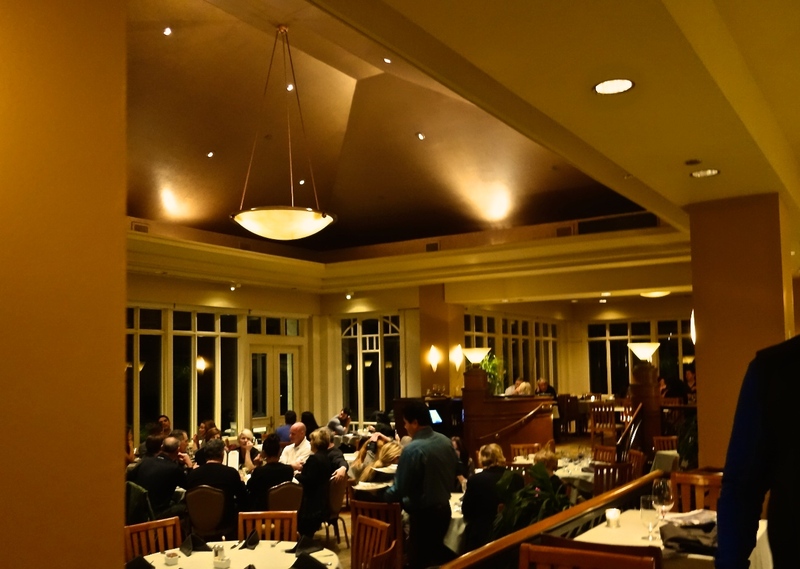 For lunch one day, we dropped by Terry’s Restaurant & Lounge at the Cypress Inn. Doris Day is a co-owner of this longtime Carmel institution and celebrated her 90th birthday here just last April. True to her animal-loving nature, the restaurant was filled with canines of every shape and size, most lying quietly beneath the tables. This good behavior was impressive, especially in the presence of so much food, although we did hear some trash talking (barking) coming from the bar area. (Sounded like an altercation between two shitzus who’d had one too many.) In fact, many of Carmel’s restaurants, shops and hotels are open to dogs. 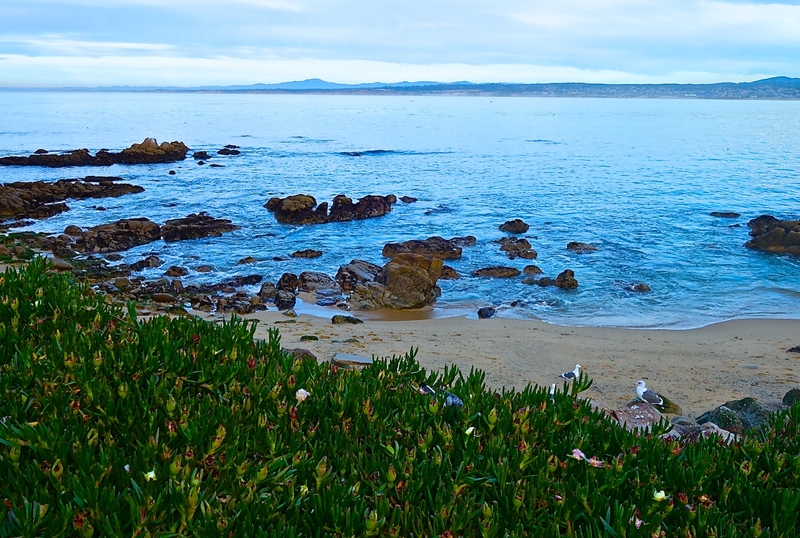 The nearby city of Monterey sits on the bay of the same name. There’s lots of shopping here and a much stronger tourist vibe. 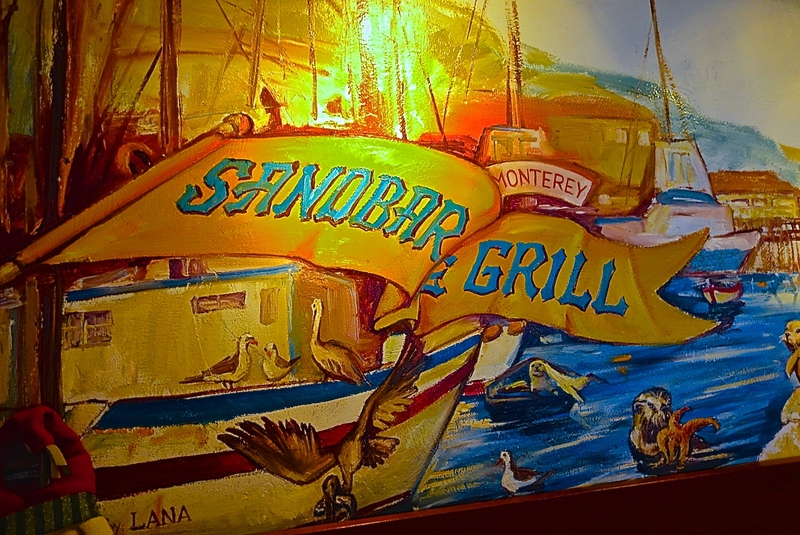 You can visit the world-renowned Monterey Bay Aquarium, grab some clam chowder and take a whale-watching cruise from Old Fisherman’s Wharf, or walk the streets of Cannery Row, formerly Ocean View Avenue, once the sardine capital of the world, and the setting for two Steinbeck novels. We enjoyed exploring Municipal Wharf 2, the commercial wharf, where you can find Lou Lou’s Griddle in the Middle, a tiny place recently featured on Diner’s Drive-Ins and Dives, and the adjacent Sandbar & Grill, which was recommended to us and where we ended up stopping for a meal. 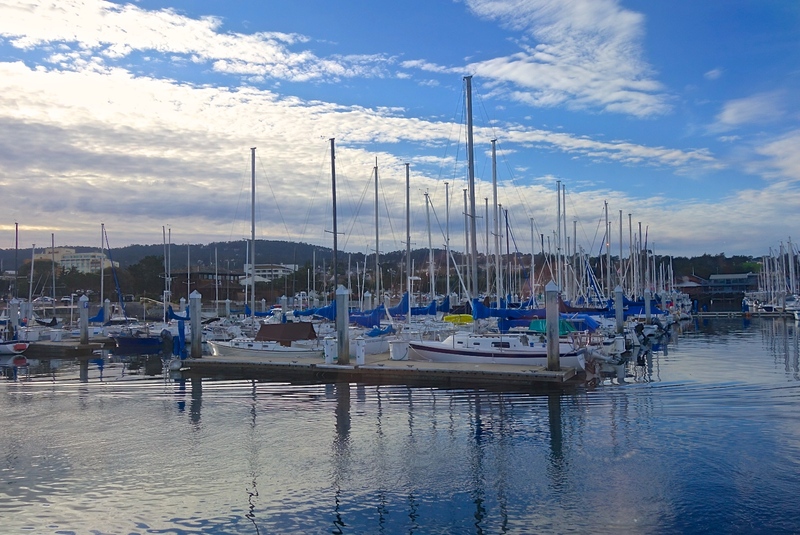 The restaurant is built out from the wharf, so there are amazing views of the marina. There was a huddle of locals sitting at the long bar, and behind them, a hand-painted mural stretching the entire length of the bar area. Everything we ordered here was fresh, well-made and straightforward. 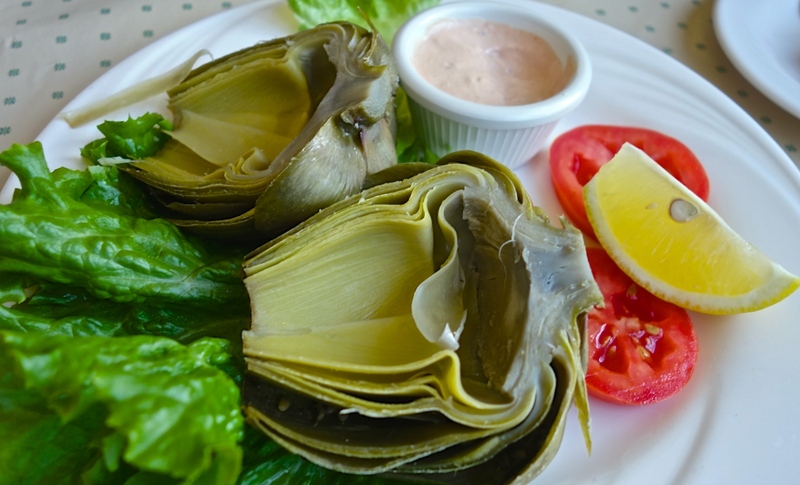 We shared several plates, starting with local, steamed artichokes and aioli dressing. 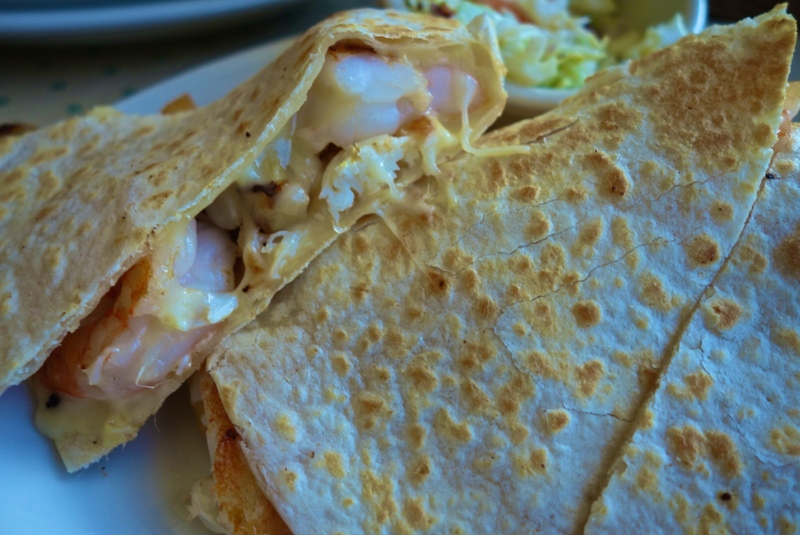 The crabmeat and prawn quesadillas were plump with seafood, caramelized onions and melted cheese (Monterey Jack, of course!). My favorite dish was under the section of the menu labeled “Calamari Corner.” (Any restaurant with a whole menu category devoted to squid is my kind of place. ): “tubes and tentacles” along with Italian sausage, cooked down in a lovely marinara. 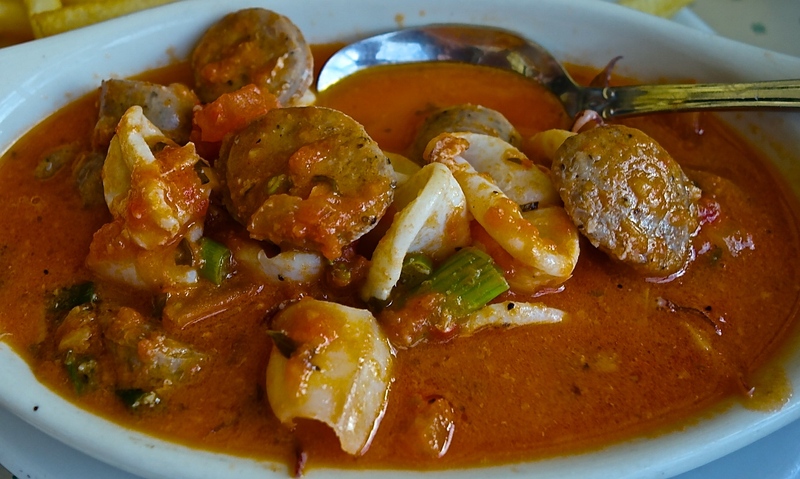 So tasty that we continued to sop slices of crusty bread in the remaining red gravy even after we had finished off all the seafood and sausage it held. The next day we took a long morning walk from Spanish Bay toward Carmel, along the narrow boardwalk trail that lines much of the roadway beside the shore and protects the delicate indigenous plant life from being trampled by all of the gawkers like me who can never get enough of the view. That’s a coastline. That’s what waves are supposed to sound like when they hit the shore. 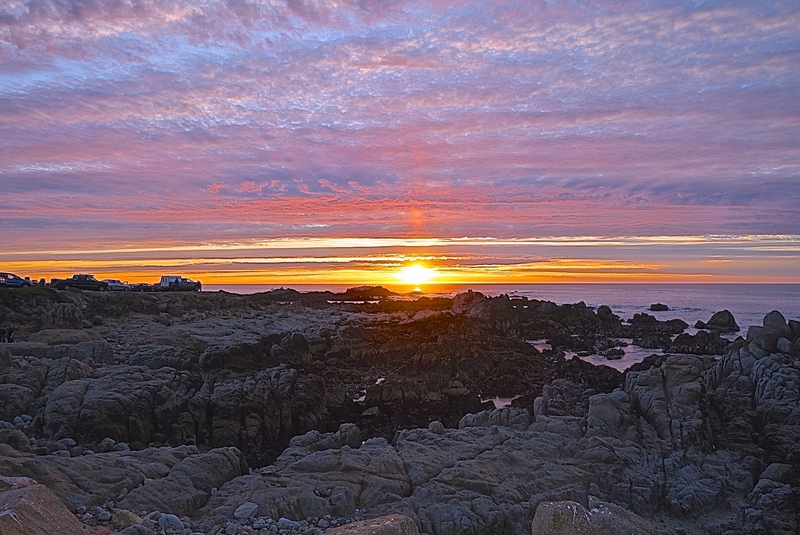 While most of the rest of the country has been gritting its teeth to keep them from chattering, slogging through some of the coldest, dreariest weather in years, the Monterey Peninsula has been unseasonably sunny. While we were there, the highs were reaching the mid-70s. And each day brought yet another dramatic sunset. 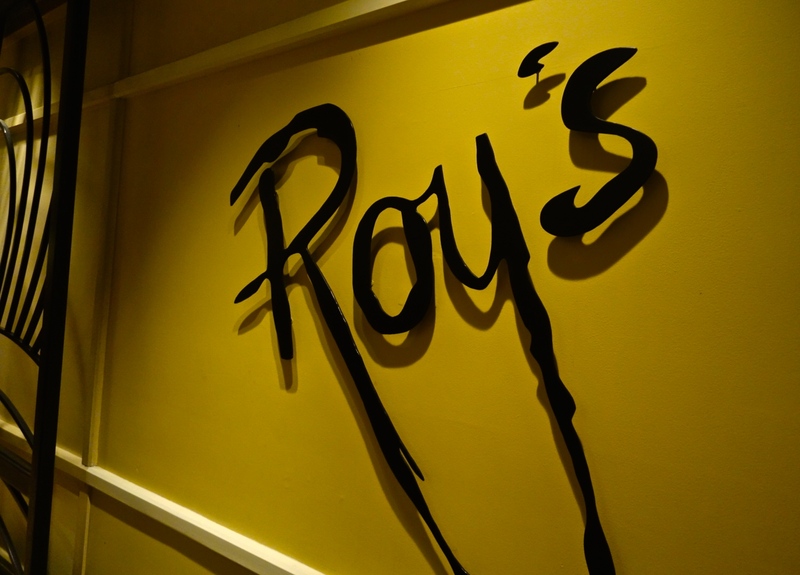 Our last night, we ate at Roy’s at Pebble Beach in the Inn at Spanish Bay. Owned by internationally acclaimed chef Roy Yamaguchi, there are a number of these great restaurants in California, Florida, and a handful of other states, including one in Plano, Texas. Yamaguchi is a James Beard Award-winner, and his Hawaiian fusion cuisine is an innovative blend of flavors and cultures. This particular location is a local and national award-winner and is rumored to be the best of the bunch. 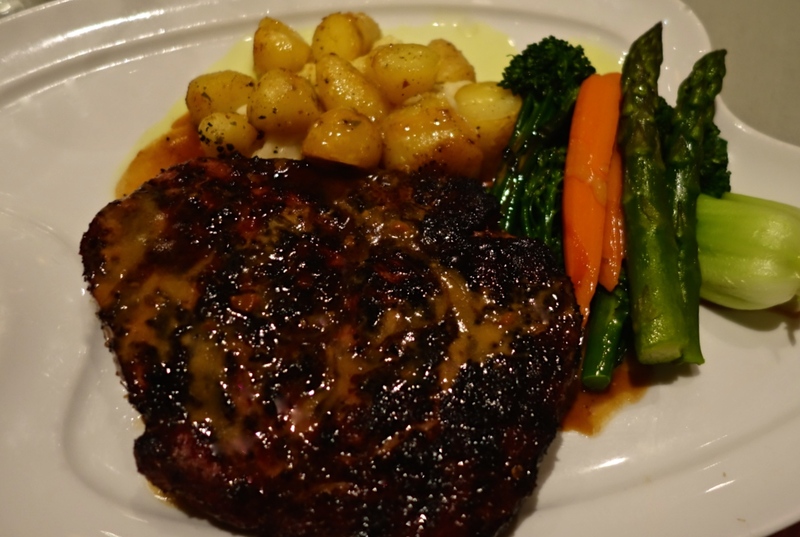 Its customized menu is full of whimsical, trendy and well-crafted dishes. 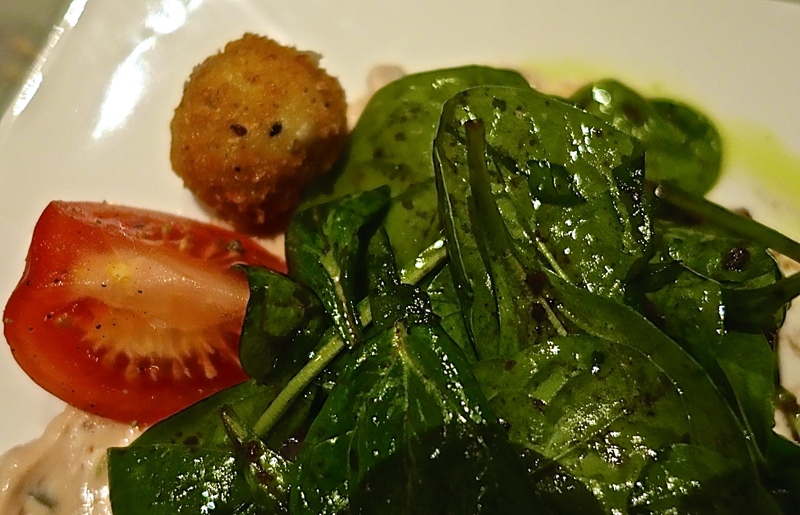 To start, John and I shared spinach salad with blue cheese croquettes, maui onion, pancetta balsamic vinaigrette. Those little croquettes of creamy cheese and crispy bread crumbs made this salad a star. 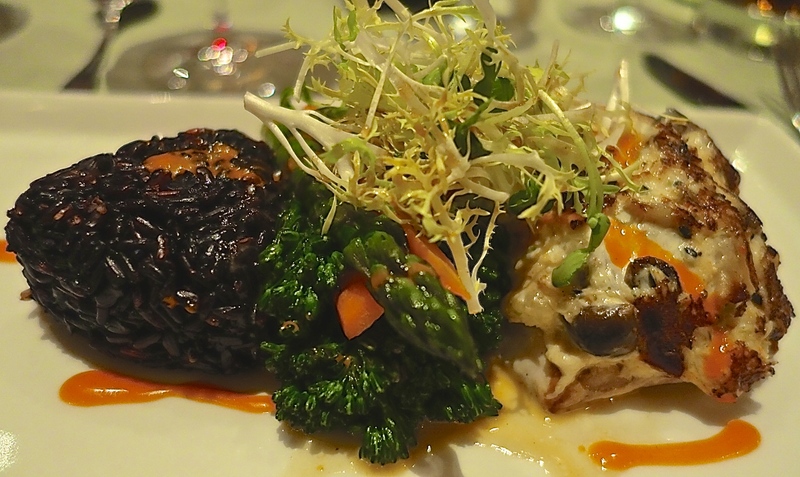 On the recommendation of our server, I ordered the Dynamite Crab-Crusted Mahi-Mahi, served with a wedge of black Thai rice and seasonal vegetables. You can’t go wrong when delicious chunks of craw claw meat have been delicately molded around a filet of fresh Mahi-Mahi. To my delight, someone in our group had the wisdom to order Roy’s Kona Mud Pie with Macadamia Praline for dessert. 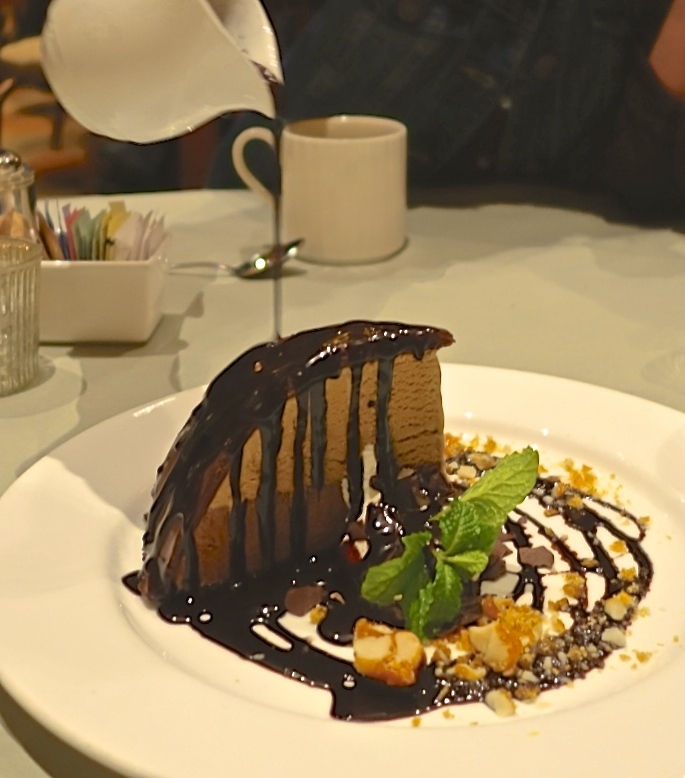 This massive slice of ice cream pie is delivered to the table with your own personal pitcher of hot fudge, so you can drizzle chocolate to your heart’s content.